Back in the dark ages before GPS was common and Siri could tell you how to find your destination, I was driving around a neighborhood looking for a house address. I can’t now remember what mission I was on — probably looking for a garage sale — but I do remember cutting through a residential alley. Tucked among some overgrown bushes I saw this old truck. 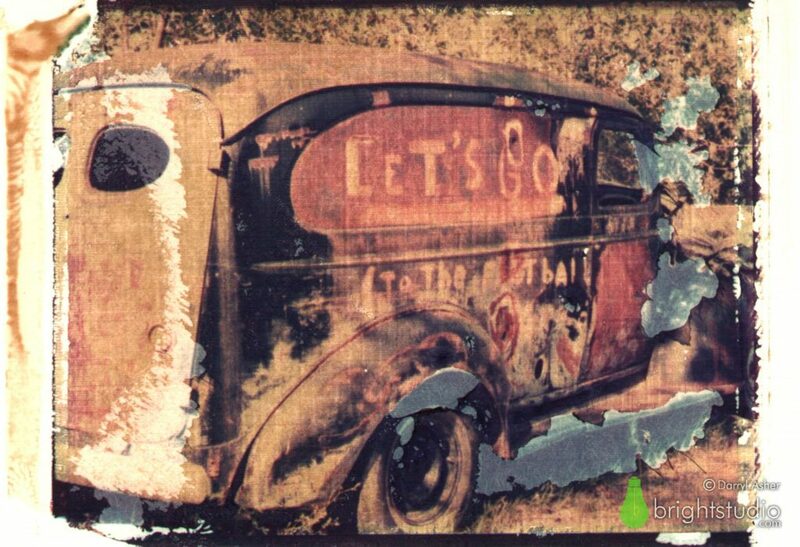 Aside from my normal attraction to old vehicles, I was struck by the irony that “Let’s Go!” was painted on the side of a vehicle that was obviously going nowhere anytime soon, nor had it probably moved for decades. Additionally, there are several bullet holes that make it look like it was used for target practice. I have no idea how the truck came to be painted. It appears the full text says “Let’s go to the football.” I like to think it was painted that way as part of a pep rally for a college or high school homecoming football game. I had my Canon AE-1 camera with me, loaded with Kodachrome slide film and I took this shot, and used the slide to expose the image to Polaroid film before transferring it to linen finished printer’s paper. That original was then scanned and enlarged to make a final print on 13×19 inch matte finished archival paper. As with a lot of my images, this one explores entropy. The effect of time, gravity, and the elements is something that has fascinated me from a young age. There nothing like getting a shiny new car, or camera, or computer, and our impulse is to try and protect our things from wear and tear. But there’s a particular beauty when something shows signs of wear that mean it’s being used for its intended purpose. Then there’s another step of entropy when something has fulfilled its purpose and is no longer being used, but is being slowly worn down, not by hands or use, but by time itself.